You are reading those stats right, it actually lowers the stats of whatever unit it's placed in. 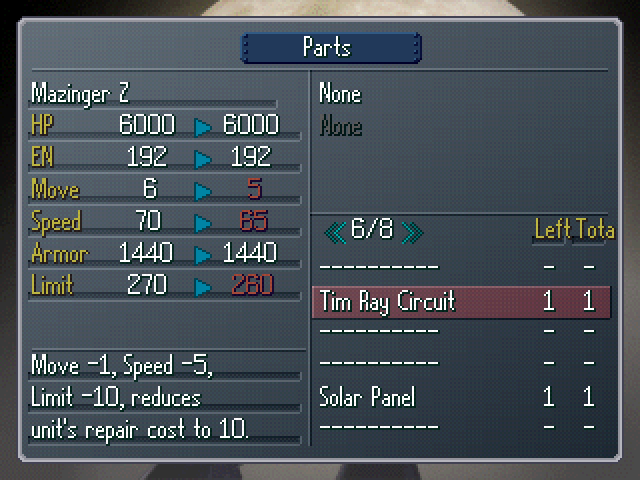 However, if a unit with the Tim Ray Circuit is destroyed, it only costs 10 funds instead of the unit's normal rate. I doubt I will ever use the thing, but I thought I should show you it all the same. Let's see how Kihel is holding up. : Yes, your Majesty. They are slowly but steadily augmenting their forces. : The same goes for the Innocent. They've begun conducting military activites at Fort Severn. : They're also engaging a squadron of our mobile suits not under our chain of command. 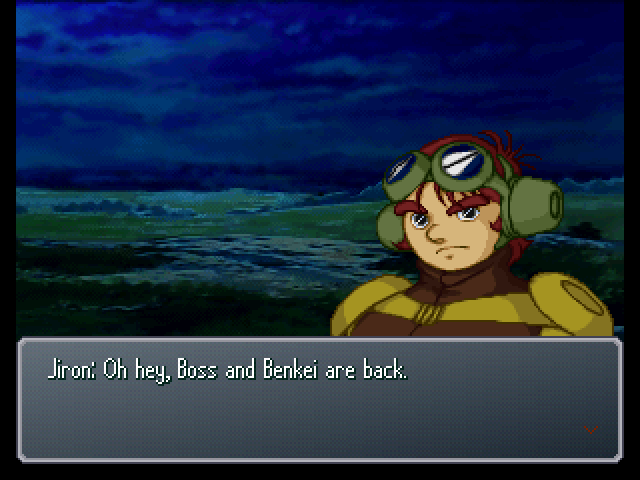 : They're under the command of the ones who operate those two unidentified mobile suits. : Meaning they must be members of the Ghingnham Fleet, I suppose. : ...In any case, unless we do something, the situation will only deteriorate further. We must act quickly to declare the establishment of our nation. : Declare the establishment of our nation!? : Yes, your Majesty. To make the Earthnoids recognize our claim to the Sunbelt territory. : We cannot do that! It would only turn the Earth people's sentiments against us! : Our repatriation must be accomplished in a peaceful manner. With negotiations suspended, if we issued a unilateral declaration of nation-founding, the people of the Earth would seek to stop us by force. : Lady Diana, the repatriates we brought with us cannot hold out in this situation much longer. We have no more time for deferrals. : Warring between the moon and the Earth has already begun. Yet here we are, still sitting on the sidelines and not joining in. : Consul Milan and I will hold a planning session regarding how to attack the Militia forces. I humbly ask you, Lady Diana, to bestow your recognition upon this operation. 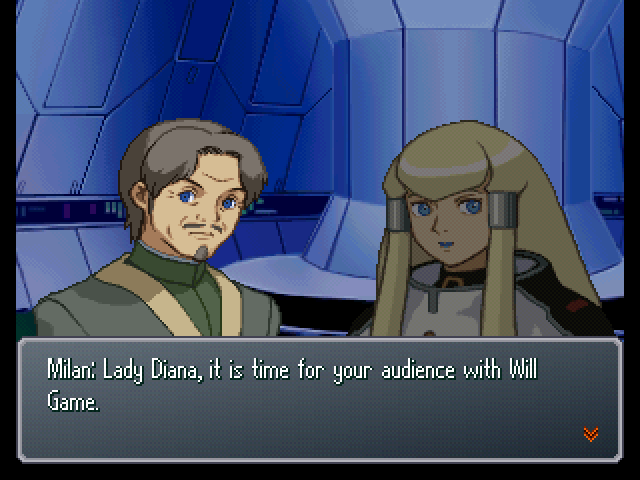 : A-are you truly Lady Diana Sorrel? : How dare you speak in that manner! : How dare I...? 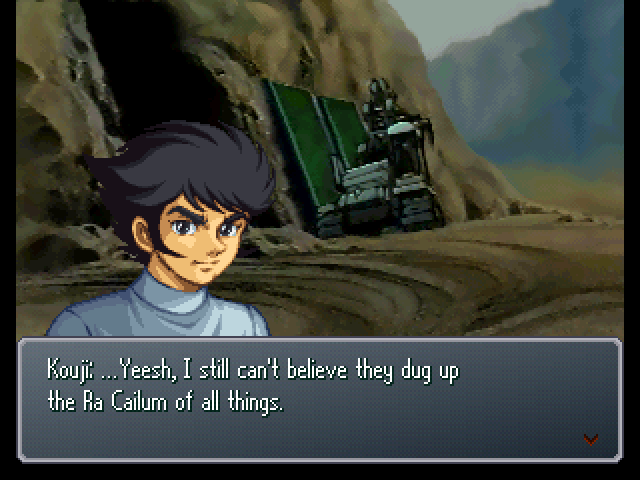 I've dug up an entire valley to unearth a spaceship and mechanical dolls, all in accordance with the claims of my forefather. My forefather was in love with a woman of the moon named Diana Sorrel... But even though you share the same name, you don't seem to know much about it. : A lady named Kihel seemed to know a lot about my forefather. Why might that be? : You are acquainted with Kihel Heim? : There are many tales of romantic affairs with maidens who come from the moon. : Heheh, and women who match that description as well. 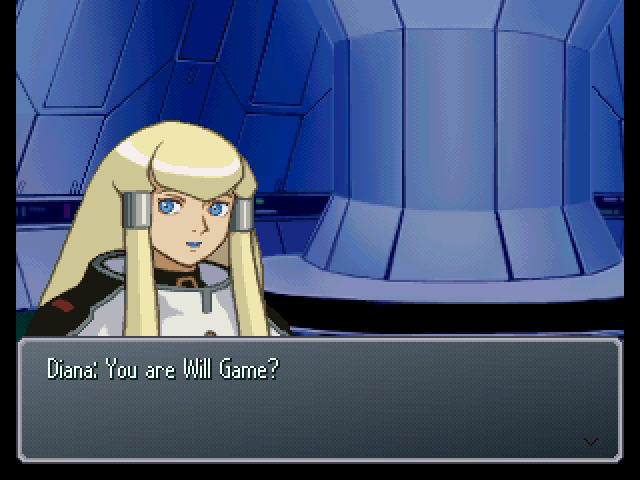 : ...Your hard work is much appreciated, Will Game. : Who do you think it is that does not approve of my system of monarchy? : With what true intent? : True intent...? The Moon Race has waited for this Earth repatriation for thousands of years. : My parents went into cryogenic hibernation together, dreaming of life on Earth. But due to their low social standing, all they could manage was quasi-hibernation. My father died. My mother remains asleep, blissfully unaware. : And people's hearts have likely changed with the exection of Operation Homecoming. : Times can change. But as long as I remain by your side, your Majesty... I shall continue to stake my life to protect you. : ...Harry, that pleases me to hear, but have you no qualms about speaking thusly? : No, your Majesty... Does that displease you, Lady Diana? : Certainly not... I am quite pleased, Lieutenant Harry. : Then may we remain as we have been thus far? : Very well, Harry... I would ask a favor of you. : According to what Will Game was saying, His Excellency Gwen and Miss Kihel Heim are both in Kingsley. 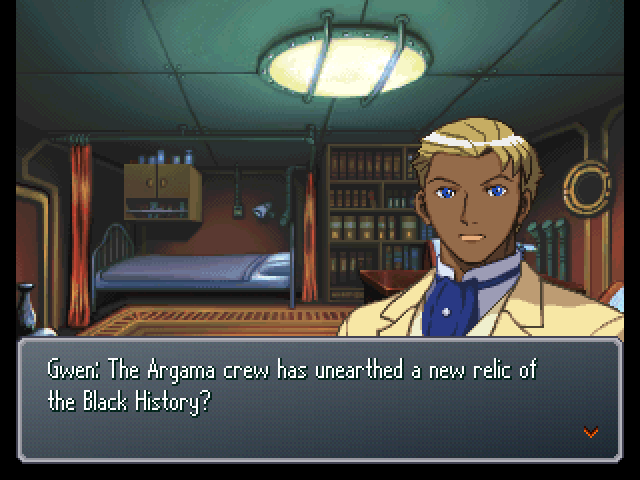 : That was confirmed in the previous battle, yes. : Do you worry about her? : The same as I do for you, your Majesty. : In that case, Harry Ord... I shall bestow upon you an order, as Diana Sorrel. : I did not ask for your opinion. This is an imperial order from Diana Sorrel. : (.........) Say, Fa. What do you think happened in our time after we left? : ...No one could have predicted that we'd wind up in this time. 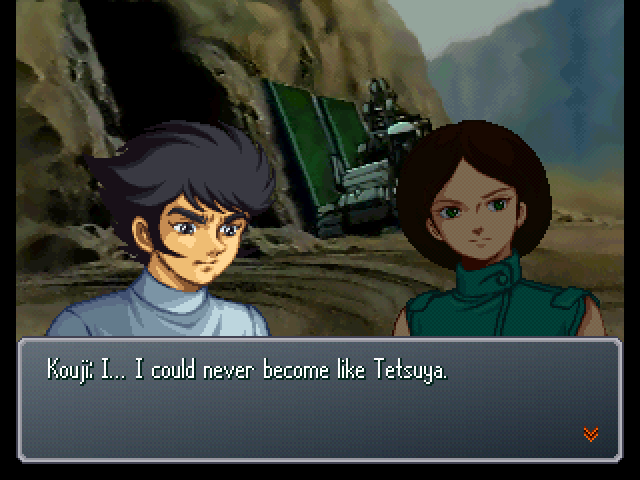 : She's right, Kouji. Instead of fretting over what we didn't do... It would be more constructive to consider how we got here, and how we can get back. : You're so mature, Emma. It's not that cut-and-dry for me. 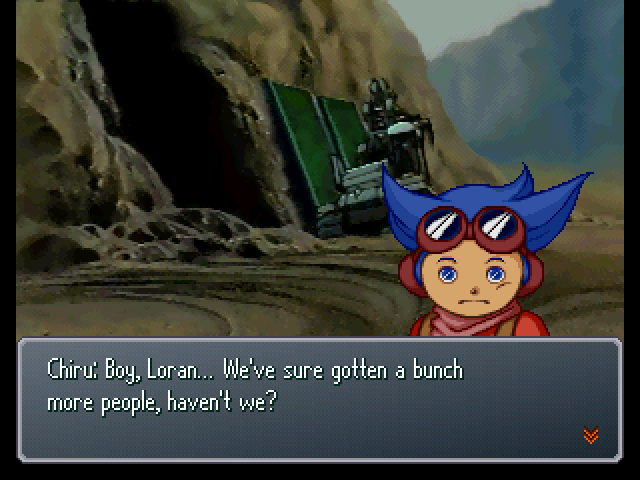 I can't help but worry about my little brother, the professor, and our friends still back there. What happened to everyone after that...? What happened to the Earth...? 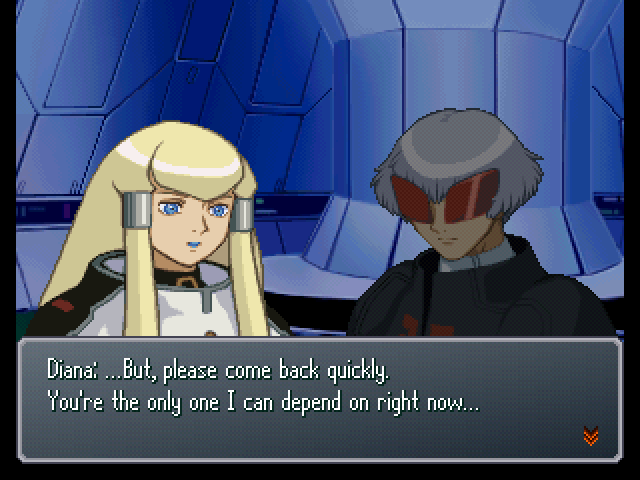 : (.........) Kouji, you have to trust that we'll make it back to our own time, no matter what. : We've made the impossible possible before, so why stop now? : (.........) Yeah... I guess you're right. : Right, being depressed won't change anything. : You could stand to learn from how tough Tetsuya is. Right now, what's important is acting, not worrying. : Kenichi! Is it true that they found it!? : Er, I've only seen it in pictures myself, but... I don't think there's any doubt. : Brother, I've moved it back to its old position with the Panzer. : Are its functions disabled? : It doesn't look like it could move much, but... 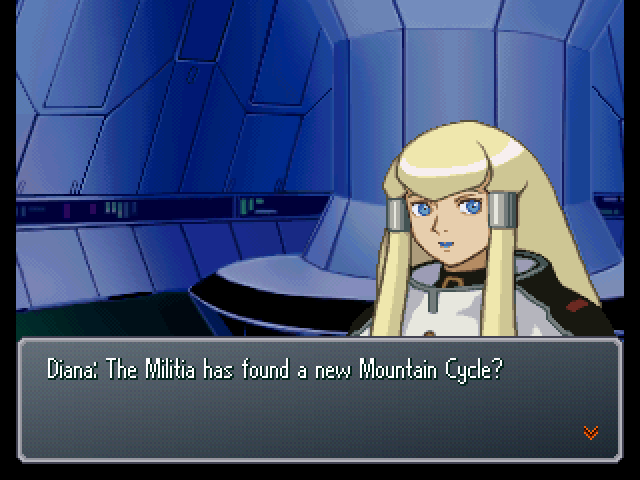 I'll bet it can start up at any time, just like any other mobile suit. : Uraki, Keith... Make this area off-limits. I'm going to report to Captain Bright. Don't talk to anyone else about this until we get instructions from the captain. : Shouldn't we dismantle something like this immediately? : It takes more than an object alone to do something dangerous. Get my drift? : Well, Gwen gathered a lot of help for the Mountain Cycle excavations. : I've heard all kinds of rumors about you. : Y-yeah... They're friends, we grew up in the same town. But what are you two doing here? : I'm a newspaper reporter in Knox. : A newspaper reporter...? Do you mean...? : Yup, I've done tons of stories on you and the White Doll. : So I'm here today covering a story too. 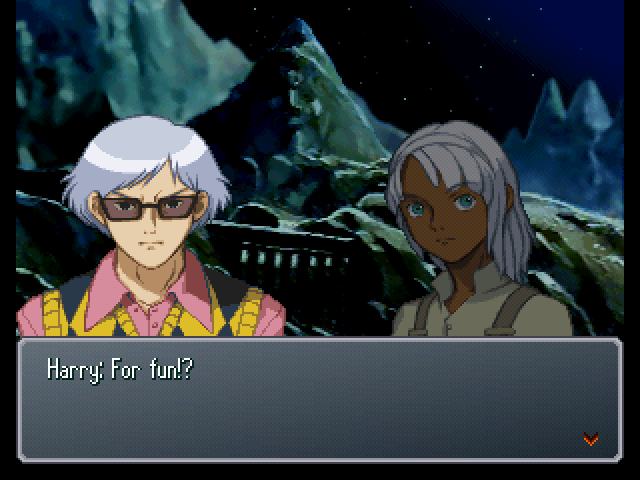 : What about you, Keith? : I worked at the Donkey Bread store in Knox. : ...The store's gone, but that doesn't mean the market for bread is. Even today, I'm here delivering bread ordered by the Militia. : ...You're doing your part too, huh? : Of course. I can't lose out to you or Fran. 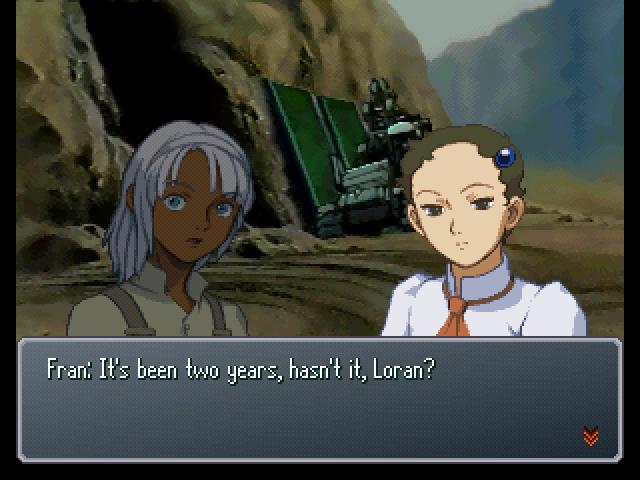 : Loran, I'm going back to join Jiron and the others. : Okay, I'll be along later. : The White Doll's pilot is publicly known as Laura Rolla, too. : I know. That was you in drag, wasn't it? : You were pretty enough to catch my eye, and I'm a girl. : S-stop teasing me. I never want to wear an outfit like that again, okay...? : Uh-huh. 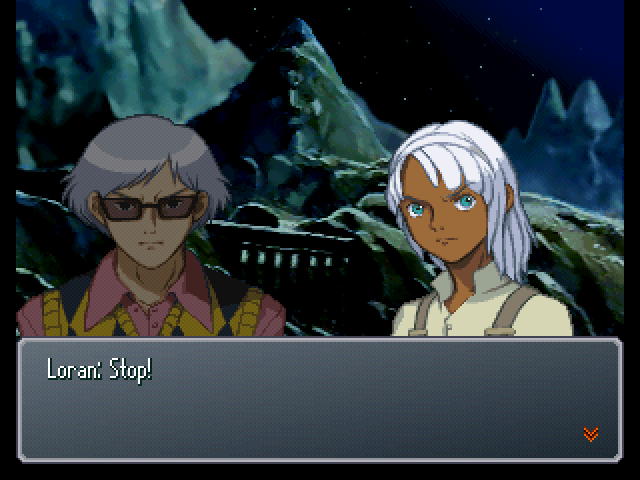 Okay, Loran, could you show me to the excavation site? : Something's wrong. Maybe it got some sand caught in the gears? : It's gonna cause problems if the Borot doesn't carry this stuff fast. : Is there something the matter, sirs? : ...I do technician work for the Militia. I'm here on a summons from Lord Gwen. : A technician!? Perfect! Take a look at the Borot for me! : Can ya fix it? : Yes... It looks like there was a bad connection in the power transmission. It should be fine now. : You're a real lifesaver! Anything we can do to show our appreciation? 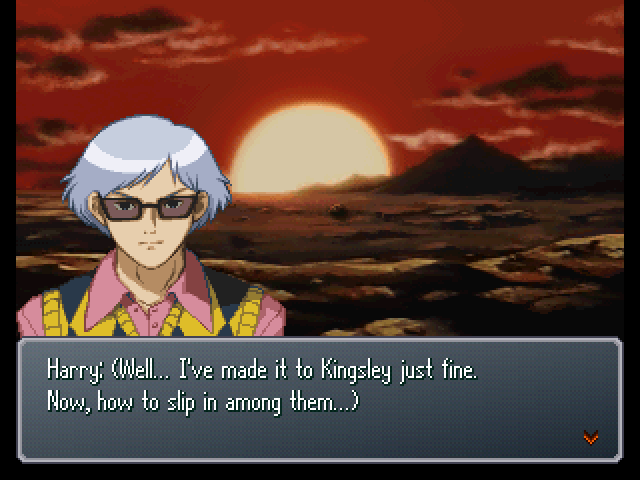 : Actually, would it be any trouble to take me to the Kingsley excavation site? : Aw, that's no trouble at all! : Yes, there's a rather large consternation over it on their ship. 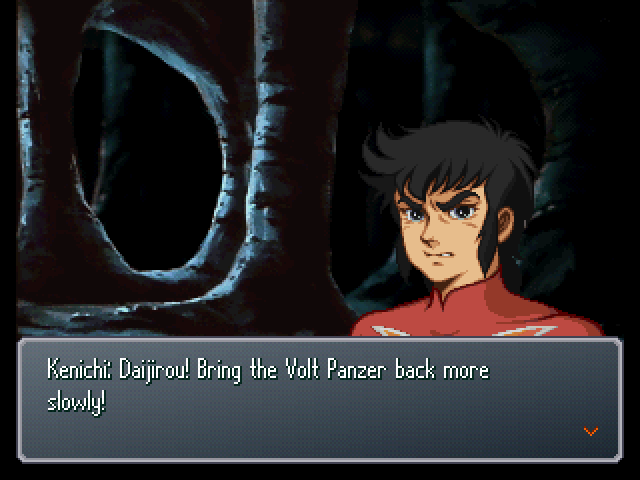 : Even that cool, collected Lieutenant Quattro looks like he's seen a ghost. : ...Sid, have you heard anything about this? : Milord... This mountain could very well be one of the Lost Mountains. : Land considered taboo among us prospectors. : Like that mechanical doll called the GX...? (...If I could get my hands on those, it would put me on equal footing with the Diana Counter... But that could also backfire and lead to them targetting us more...) Sid, we'll need to increase security around the perimeter. Call Colonel Mikhail for me. : Took them long enough... What was keeping them? : Hm? 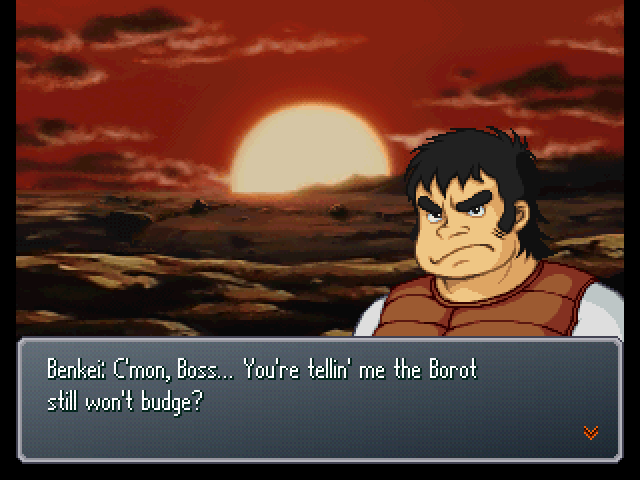 There's another person riding in the Borot. : My Borot ain't that much of a pansy! : Gimme a break, we wouldn't have even gotten back if not for this guy! : He's right, you know. In such a desolate wasteland, you should take care to keep mechanical dolls well-maintained. : Well, I need to find someone, so I'll be on my way. 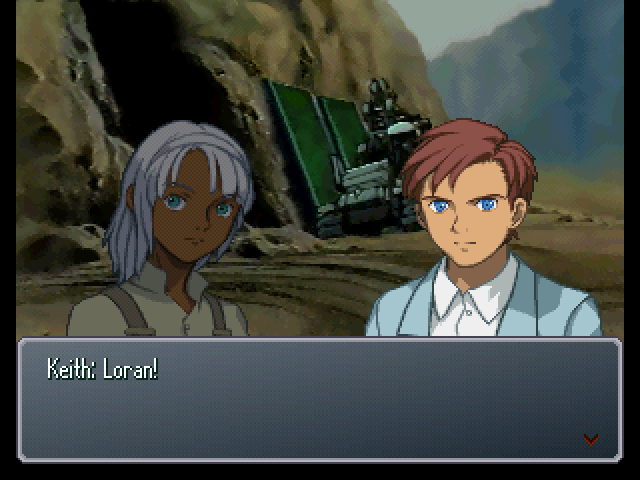 : Hey, Loran! Where are you going? 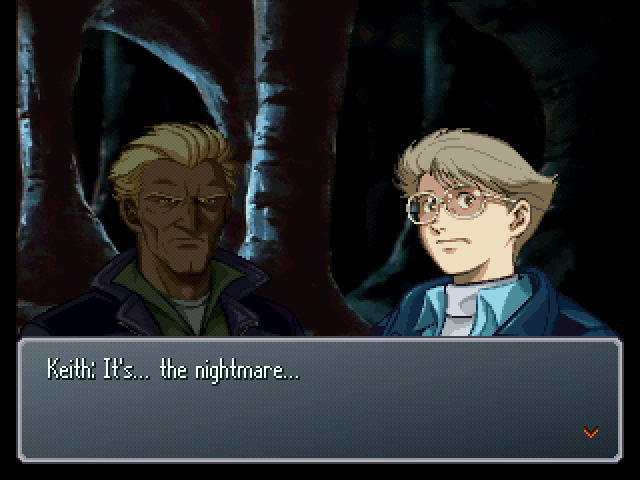 : Harry... What are you doing here?! 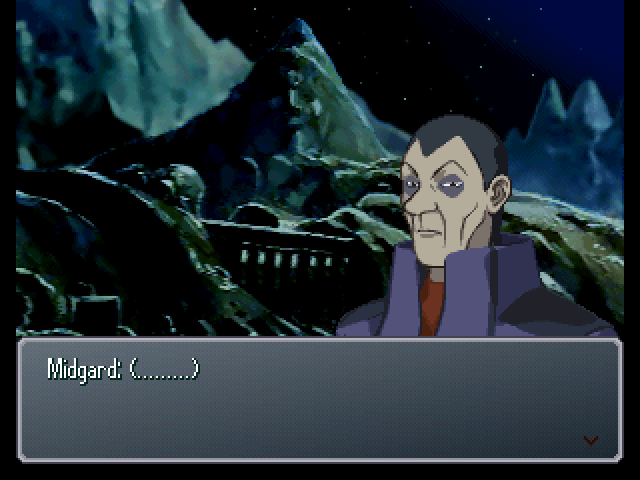 Don't tell me you're here to destroy that spaceship? : ...I am deeply ashamed. : Enough. We mustn't stand out to passers-by. : Are you going to destroy that spaceship? : Yes, your Majesty. So I'd like to get you out of here immediately. : I'm afraid I cannot, so I must beg your indulgence! : Where are you trying to take Kihel?! : Lieutenant Harry came to warn us that we will come under attack. At great personal risk. : You mean you would desert the royal guard and join the Militia? Really? : Don't be absurd. It's nothing of the sort! 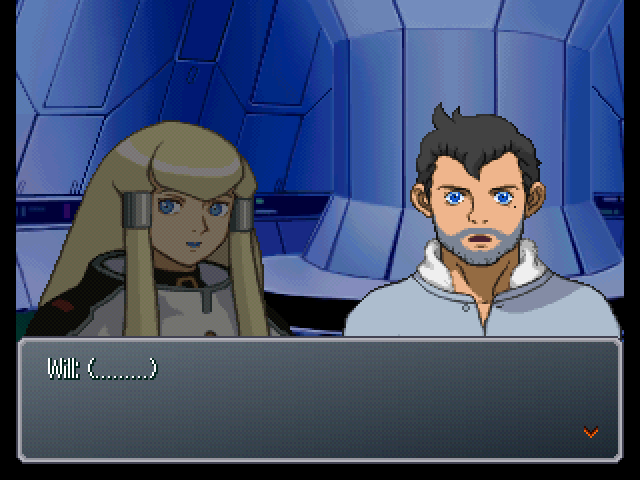 : So you're here to abduct Miss Kihel!? : What are you talking about!? It's Miss Kihel!! : All this time, and you've never realized!? 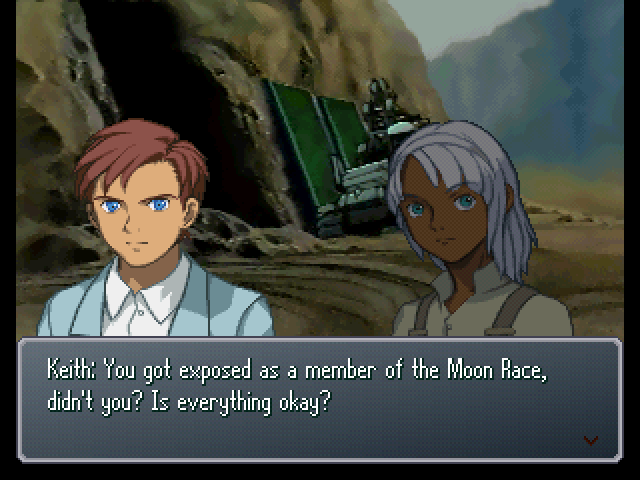 : Pathetic, you're all just as bad as Consul Milan and Lt. Cmdr Phil! : What's all this about!? : That... There's no way that could...! : This person is Lady Diana Sorrel. I've come here to accompany her. : B-but that's...! What about the Lady Diana on board the Soleil, then...!? : Y-you're really her...? 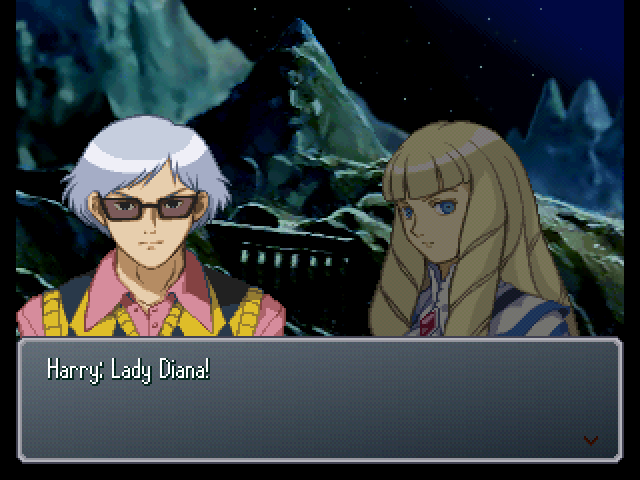 You're really Lady Diana Sorrel!? !! You don't mean... Miss Kihel is...!? : You believe that you can keep Lady Diana safe in a place like this!? : Still, disguising yourself and going to all this trouble to get Lady Diana out!? : You were the one to disguise yourself first! : Lady Diana, I shall take you to a safe place. : No, Harry. As long as I am here, I am Kihel Heim. : I shall remain here a bit longer. I would like to spend time among the people of Earth, and consider what comes next. 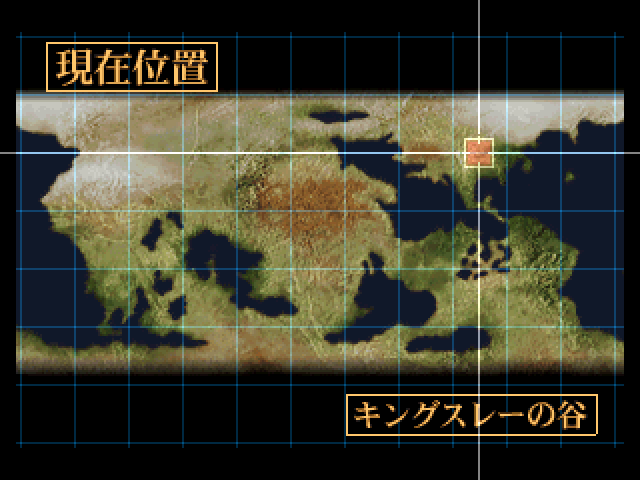 : What would you have become of Miss Kihel on the Soleil? : It is the royal guard's duty to protect the queen, is it not? : ...Understood, Lady Diana. 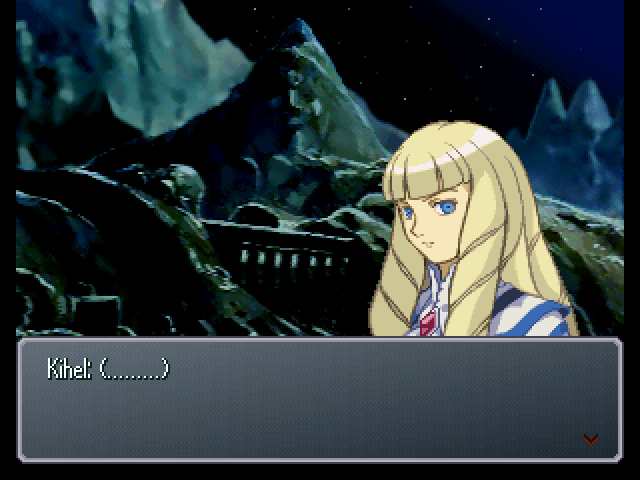 Laura... Or rather, Loran Cehack. Take care of Lady Diana. : Alright, let's get out there, then! : ...The things you see when you come to investigate relics of the Black History. The Diana on the Soleil is an impostor, and the seal on the recently unearthed machine is unmistakeable... This should make a most excellent souvenir for Commander Ghingnham.